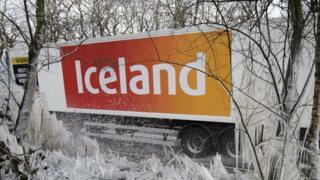 The chief executive and founder of Iceland Foods has described a dispute with HMRC over the company's Christmas savings scheme as "just madness". Under the scheme, staff can voluntarily set aside money from their weekly wages and claim it back later. However, HMRC has told the company the payment means staff are technically falling below the minimum wage. Iceland founder Malcolm Walker intends to fight the HMRC claim, which was first reported in the Times. If it loses, the retailer could face a bill of £21m. HMRC said it did not comment on individual cases. However, the Department for Business, Energy and Industrial Strategy is currently consulting businesses on how salary sacrifice schemes work alongside the National Minimum Wage. According to Iceland, it has also been told by HMRC that its policy on footwear breaches minimum wage rules as well. HMRC said that staff should be compensated for shoes bought for work, as Iceland had given staff guidance that "sensible shoes" should be worn. The guideline applies only to staff who work in stores, since warehouse staff are provided with safety shoes.